Use this LouAna canola oil in place of butter, shortening, or other cooking oils for a variety of cooking and baking applications! Not only is this oil extremely versatile, but it's also a healthy choice. This canola oil is an excellent multi-purpose ingredient for any establishment, and the 35 lb. container will keep your restaurant or cafe in good supply. With so many uses and benefits, this canola oil is an indispensable ingredient for your kitchen! With its high smoke point of 450 degrees Fahrenheit, it's a great choice for frying. Use it for freshly-popped popcorn at your concession stand or movie theater to make a superior snack. Canola oil is crushed, extracted, and refined from harvested canola seeds. What makes it so popular among cooking applications is its neutral taste and high heat tolerance that's suitable for anything, including grilling and frying. Plus, the bag-in-box design is a convenient way to store and use your oil. The box makes transporting all 35 lb. easy while the bag within has an easy-to-use connector for your popcorn machines. 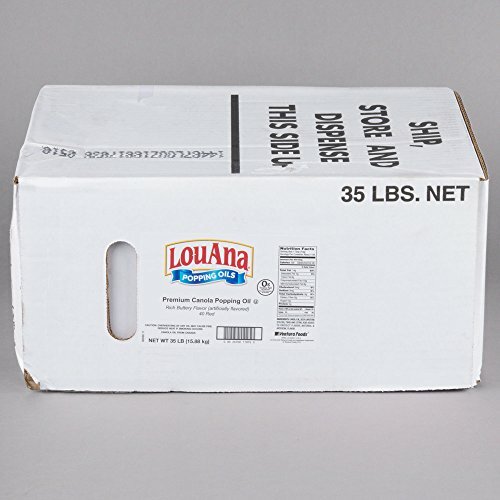 Stock up on this bulk 35 lb. container and discover the many uses of this canola oil!